In front of the sea, on the beautiful beaches of Costa Teguise, in Lanzarote. Completely renovated, with a bright and contemporary interior, HD Beach Resort & Spa offers a high-end all-inclusive service with water sports, entertainment area, water games and the unique chromotherapy of its spa as a relaxation area. At dusk you can enjoy enogastronomic experiences on the chill-out terrace with spectacular views of the sea. Reception 24 hours. Wake up service. Medical service (fees apply). Luggage storage. Free cots (subject to availability). Car / bicycle rental. Public outdoor parking (no charge). Laundry service: washing machines and dryers (fees apply). Wi% free high speed. Miniclub, playground. Designed by the famous architect Fernando Higueras and surrounded by botanical gardens, this luxurious 5-star beachfront hotel is a small paradise. The resort has six places to eat and drink, facilities for a wide range of sporting activities such as mini golf, tennis and volleyball, and a large heated lagoon style pool. At the Meliá Salinas, the rooms feature complimentary wi-fi access and all the amenities you would expect from a 5-star experience. Until August 28, 2017, some of the hotel rooms are being renovated, which can cause some kind of daily disturbance from 10AM to 6:30 PM. The 4-star Barceló Teguise Beach is a contemporary adults-only resort, found in Costa Teguise, just a short walk from Cucharas beach. 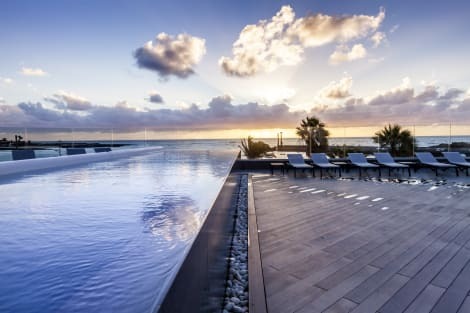 Inspired by local architecture, the resort is home to several bars and a buffet restaurant, as well as two infinity pools and a wellness centre. Rooms at the Barceló Teguise Beach all have large LCD TVs with satellite channels, free wi-fi, and private bathroom as well as a terrace or balcony. This stunning, contemporary 4-star hotel offers beach, shops, bars and restaurants just a few steps away. Relax at one of the Occidental Lanzarote Mar's two restaurants, or sip a cocktail on the terrace. Designed with ultimate comfort in mind, the hotel has a wellness center, parking (extra cost), pool and sauna on-site. And to complete the package, all rooms come with free wi-fi and Plasma TVs. 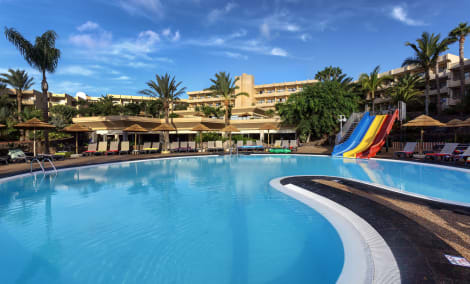 Located in the town of Costa Teguise, on the island of Lanzarote, Oasis Lanz Beach Mate is just 350 meters from the beach of Jablillo, near the shopping and leisure area. This resort offers a total of 151 apartments and rooms. The resort stands out for being surrounded by gardens and two swimming pools, one of them heated with tennis court and gym. It also offers a large bar-restaurant offering a buffet service for breakfast and dinner, snacks and beverages are served throughout the day. Recently renovated rooms offer a modern, functional and very comfortable design, as well as free wireless internet access, pool towels and safe. Private parking is available outside the hotel free of charge. The hotel is running refurbishment works until the 31st of May 2019 in order to improve the property facilities. 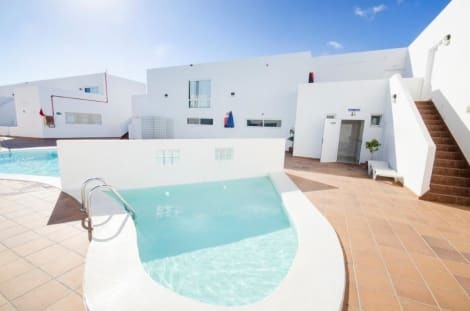 The Blue Sea Costa Teguise Gardens property is the perfect place to spend a great vacation on the island of Lanzarote. This wonderful 3-star resort is perfectly equipped with all the amenities and services. Ideal for families or couples, this fantastic apartment complex offers all-inclusive board basis as well. 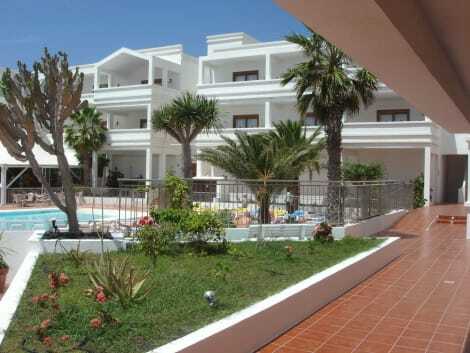 The property is located in Costa Teguise and is surrounded by golf courses and other activities. This completely refurbished resort offers bright and spacious rooms, as well as great facilities for a fun-filled holiday for the whole family. The BlueBay Lanzarote is surrounded by the astonishing landscape of the Island of Lanzarote and the Costa Teguise Beach. Enjoy its wide range of leisure activities and body-mind relaxation, with a varied offer of Spa treatments! There is also a fitness area, a tennis court, 2 swimming pools and a children area. 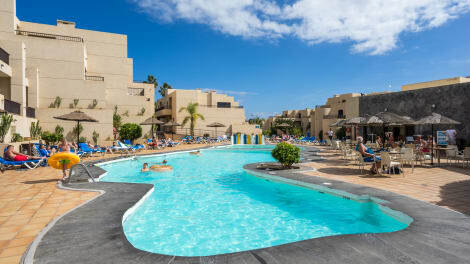 Situated in the popular tourist destination of Lanzarote, Apartamentos Blue Sea Costa Teguise Beach enjoy a great location in a peaceful area of one of the island’s most attractive resorts: Costa Teguise. The family-friendly complex is just 800m from the beach, so is perfect for those in search of Atlantic sun, glistening blue sea and golden sand. Those preferring to soak up some rays from the comfort of the residence can do so at the large, inviting swimming pool where sunbeds are available. There’s a separate pool for kids to splash around in with new friends. Make yourself at home in one of the 175 guestrooms featuring refrigerators. Rooms have private balconies. Complimentary wireless Internet access keeps you connected, and cable programming is available for your entertainment. Bathrooms with showers are provided. With a stay at El Guarapo Apartamentos, you'll be centrally located in Teguise, within a 10-minute drive of Las Cucharas Beach and Costa Teguise Golf Club. This apartment is 11.8 mi (19 km) from Pocillos Beach and 4.2 mi (6.8 km) from Cesar Manrique Foundation. Take in the views from a terrace and a garden and make use of amenities such as wireless Internet access (surcharge). Additional features at this apartment include a television in a common area, tour/ticket assistance, and a reception hall. Make yourself at home in one of the 52 guestrooms, featuring kitchenettes with refrigerators and stovetops. Your room comes with a Select Comfort bed, and all rooms are furnished with double sofa beds. Rooms have private balconies or patios. 32-inch plasma televisions can provide entertainment. This apartment complex is centrally located in the tourist resort of Costa Teguise, just some 400 m from the beach and around 800 m from the town centre. It is just a short distance from shopping areas with boutiques, bars and restaurants The complex comprises a total of 36 apartments. The apartments all come with an integrated living room/ bedroom, a separate bedroom, an en suite bathroom, a direct dial telephone, a hire safe, and either a balcony or terrace. Pamper yourself with a visit to the spa, which offers body treatments and facials. You're sure to appreciate the recreational amenities, which include 2 outdoor swimming pools and an outdoor tennis court. Additional amenities at this hotel include complimentary wireless Internet access, concierge services, and babysitting/childcare (surcharge). Getting to the surf and sand is a breeze with the complimentary beach shuttle. 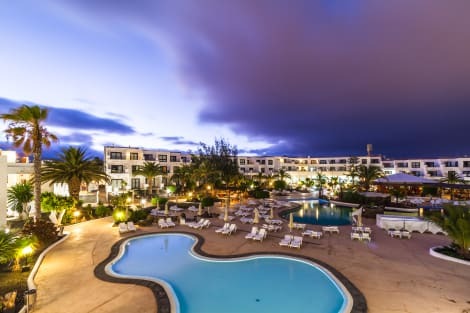 Overlooking the picturesque El Ancla cove, the Occidental Lanzarote Playa is a modern 4-star hotel, found a short drive from the centre of Costa Teguise and 12km from the airport. The hotel has both buffet and a la carte restaurants, an outdoor pool, lobby and pool bars and sports and entertainment facilities including a gym, sauna, hot tub and children’s club. Furnished in a modern style, rooms at the Occidental Lanzarote Playa offer satellite TV and a balcony or terrace. Holidaymakers love the convenience and simple street layout of Costa Teguise, and for good reason. The resort on Lanzarote was deliberately built for tourists. It's only a 15-20 minute drive to Lanzarote (Arrecife) Airport, from which you can get to and from London, Birmingham, Bristol, East Midlands, Manchester and Liverpool. Most of the Costa Teguise hotels are relatively new buildings, with all mod-cons and modern architecture. Some hotels are adults-only for that bit more exclusivity. The island is 37 miles long and 16 miles wide, so getting around is easy – especially by car or bus. It's one of the largest Canary Islands, and there's a lot to see and do. The striking black landscape of Timanfaya National Park is topped off with the Islote de Hilario volcano. A restaurant at the summit uses the volcano's heat to grill meat and fish. The whole park is ‘hot' – as you enter, you'll get a demo of water turning instantly into steam. On the same side of the island, Playa Blanca has a quieter café culture and an expansive port area. When the sky is clear, you can see all the way over to Fuerteventura. The town has four beaches, all of which are natural. Bastian beach has the biggest family-friendly atmosphere, and Las Cucharas beach is popular for windsurfing. Pueblo Marinero is a former fishing village that's now home to some of the island's most luxurious hotels and apartments. A stroll around the area is a little taster of the high life. If you're in the mood for a little more excitement, head to AQUAPARK Costa Teguise. As well as enjoying the water park, you can have a go at paintballing and kids can tackle the adventure playground. A mix of British and Irish pubs and Spanish tapas bars line the streets. Costa Teguise also has pizza, Chinese restaurants and Italian food. When it comes to cuisine local to Lanzarote, seafood and fish are important ingredients. Some of the most popular dishes are the simplest, such as pescado a la sal – fish baked in salt. One dish that's quite unique to the island is Sancocho Canario. It's made similarly to a stew or casserole, using salt fish and sweet potatoes.